In Paris recently I noticed an extraordinary phenomenon unfolding around the Eiffel Tower during a casual afternoon stroll. The sans-papiers—as the undocumented migrants are known in local parlance—vended touristy souvenirs around the Champ de Mars, Place du Trocadéro, and the Palais de Chaillot. They often played hide-and-seek games with the police to avoid detection. Struggling migrants from Africa—or more specifically from countries such as the Republic of Congo, Côte d’Ivoire, Chad, Mali, Senegal, Eritrea, and Niger—these vendors live a shadow life in Paris and survive in a particular type of parallel underground economy of the city’s tourism industry. Curiously, they sell mostly one product: miniature replicas of the Eiffel Tower. Their surreptitious economic footprint wraps around Gustave Eiffel’s soaring tower, built in 1889 to commemorate the centennial of the French Revolution. Here is the great irony. The sans-papiers—whose best self-defense in a hostile environment, one would imagine, is to be socially invisible—make a living peddling the most visible, conspicuous architectural icon of Paris. Many of them cross the Mediterranean Sea in rickety boats risking their lives, gradually move from different port cities to the cultural and economic heart of France, and, finally, occupy a social space that accidentally conflates two most unlikely global conditions: the migrant’s unstable, floating life, and iconic architecture, percolating within the transient space of global tourism. The story doesn’t end there. 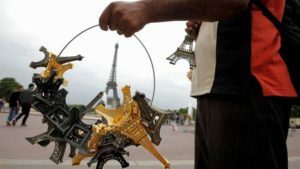 The miniature Eiffel Towers are made in China. The socially invisible migrant sells the most visible architectural trope of French cultural chauvinism to tourists from across the world. The social dramas that take place around the Parisian monument offer poignant narratives of modern migration, globalisation, xenophobia, anticipation, and nationalist angsts. Thus, the migrant’s story couldn’t be explained away as one of mere resilient survival. Many African observers believe that the current migration crisis is a result of some of France’s postcolonial practices. French businesses brought large numbers of workers from former African colonies as cheap labour. Current migrants continue to come to France with hopes of finding work, building a better life, and joining family members who have already settled there. They also try to escape from ethnic conflicts, civil wars, corrupt governments, and lack of economic opportunities in their home countries. Like the uncertain and unwelcome lives of the migrants roaming around its base, the Eiffel Tower’s beginning was dubious. Before it was inaugurated on March 31, 1889, Gustave Eiffel’s monumental structure attracted the wrath of many of France’s famous writers, artists, and intellectuals, who wrote a scathing letter, rejecting the iron “monstrosity” as fundamentally incompatible with French values and aesthetic consciousness. Eiffel sought to justify his creation on both aesthetic and functional grounds, offering a range of historic precedents and a seemingly inexhaustible list of practical uses for the tower. In the 21st century, the sans-papiers find themselves in a somewhat parallel situation, having to justify their presence in France on grounds of human rights, open-society ethos, and social justice. The great French writer Guy de Maupassant hated the Eiffel Tower, the then-tallest human-made structure in the world (the record previously held by the Washington Monument), yet he lunched at the restaurant located inside the tower, so that he wouldn’t have to see it. By going in, thereby internalising it, Maupassant self-choreographed a love-hate relationship with the Eiffel Tower.